This time, he's going to be the one entertaining. What, do you not hear the roar of the crowd? Do you not see the coliseum filled to the brim with spectators? Did you not realize they were all there to see your child battle? Of course you did. You knew exactly what would happen when you got your child this Gladiator Champion Costume. You knew he would become Rome's top superstar battler, and the most important attraction in the stadium. You knew exactly what would happen, because not only do you have awesome costume intuition, you also know a thing or two about history too! 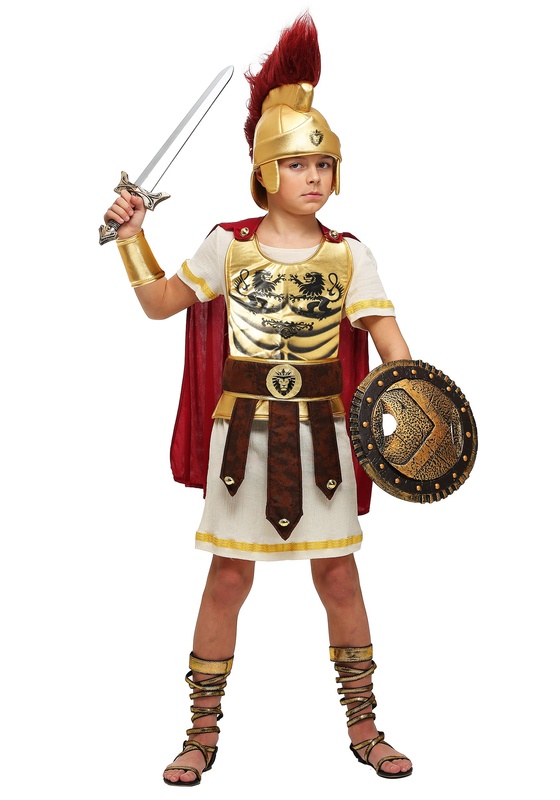 Maybe your kiddo doesn't know all the much about the ancient gladiators or the show downs the held in the Roman Coliseum. No matter. When they have this super sweet costume, they're going to have a battle-ready look ready to roll! It’s styled as a tunic along with a chest piece and helmet, and it also comes with belt and arm guard accessories to complete the ensemble. With soft foam armor pieces and real ancient styling, he’ll be ready to make his long awaited appearance on the floor of the coliseum! This costume is made and designed by us right here at HalloweenCostumes.com, and you're only going to find it for sale right here. Get him this signature costume, and yes, we're very sure everyone he hangs out with is going to be very, very entertained!